Aaron Petersen showed me how to make a website in Microsoft Word and how to upload files. I got an account from Geocities and Zaakistan was born. It was pretty empty to begin with, but through time, other things were added. The list of life goals became the focus and the base for such elaborate sites as the cycling trip accross Canada, the voyage down the Mackenzie River, and the family tree. I later edited sites in FrontPage and now I use Dreamweaver on my iMac. 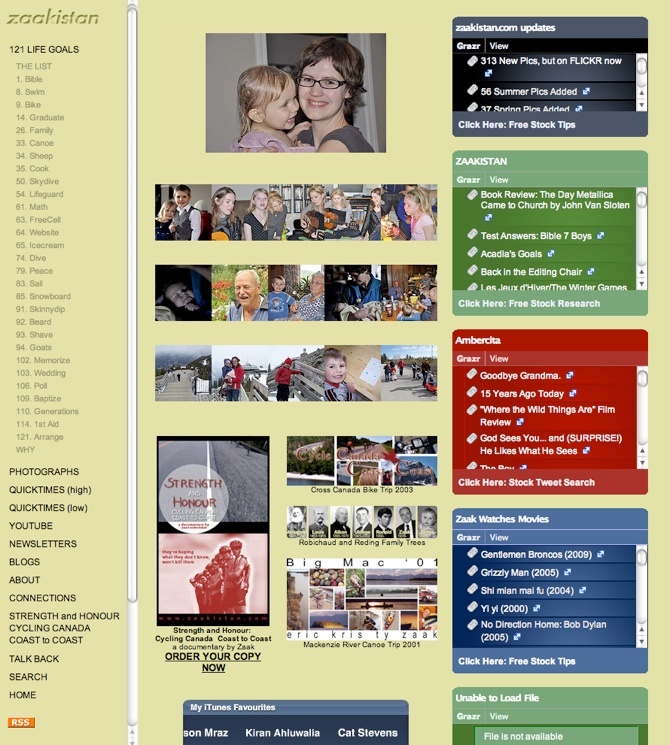 in 2009 I reworked the site in iWeb and added YouTube, Flickr, and Blogger elements. In the summer of 2015 I discovered that iWeb is no longer supported (for 4 years already, I was a little slow…), so I switched to WordPress – a fantastic platform for sure. Space was required in order to post more pictures and videos so webspace was purchased at IX webhosting and the domain name for www.zaakistan.com was initiated. I hope you enjoy browsing this site, I certainly have enjoyed developing it.